Pulling together a big holiday meal is always an interesting challenge, no matter how many times you've done it. Taking your turkey out of the oven and preparing it in a countertop roaster instead is one well-proven way to make your life simpler. 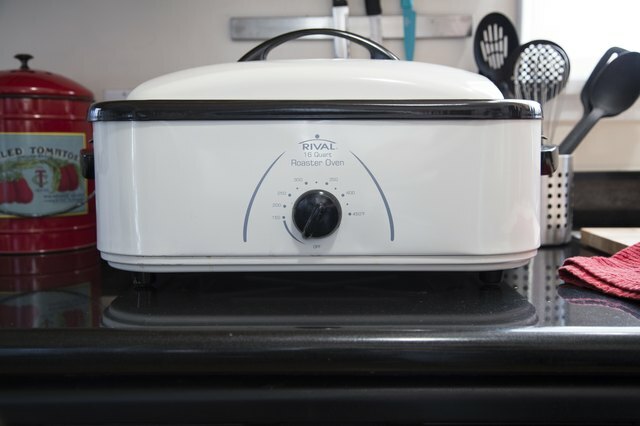 The roaster oven gives you a finished turkey in less time, and it leaves your oven free for all of those side dishes you'd planned. A roaster oven works much the same as roasting in your conventional oven, but "much the same way" isn't quite "exactly the same way." Your Rival roaster oven is much smaller than a conventional oven, whichever size you own, and that has a big impact on how it works. The relatively small space inside the countertop roaster traps a lot of moisture that would evaporate from your bird in a conventional oven, and it keeps it confined inside the relatively roaster's relatively small cooking well. That moist air transfers heat more effectively than the dry air of a conventional oven, so you'll find that your turkey cooks a bit faster than usual. It also helps keep your turkey moister as it roasts, which is a good thing. 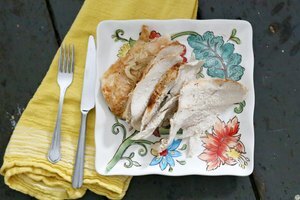 The downside is that the turkey's skin won't come out as crisp and golden as it does in a conventional oven, but there are ways to work around that. The size of your roaster limits the size of the turkey you can cook in it. The 18-quart Rival turkey roaster can manage a bird up to 20 or 22 pounds, and the 22-quart model can handle a bird in the 25 to 28 pound range if necessary. Ideally, you don't want the bird to be in contact with the sides or lid of the roaster, so you might need to truss it with twine just to keep it compact enough to fit properly. If you're not sure of your turkey-trussing skills, then you might be better off to buy a slightly smaller bird. A good rule of thumb is to allow a pound of turkey size for every quart of your roaster's capacity, which should leave enough room for your bird to fit comfortably and without fuss. Set the rack in the bottom of your roaster, and preheat it to your preferred cooking temperature. Rival roaster directions call for a temperature of 375 degrees Fahrenheit for a pre-basted bird, or 350F for a fresh one. 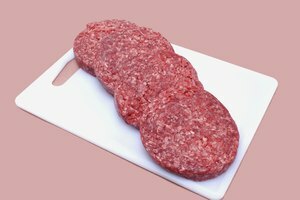 You can take that down further if you wish, though the USDA recommends going no lower than 325F to ensure food safety. Pat the bird dry and season it to taste; then reach in – taking care not to burn yourself on the roaster's hot sides – and position the turkey on the rack. Insert a leave-in meat thermometer or probe thermometer if you're going to use one, and then close the lid and set the timer for your expected cooking time. 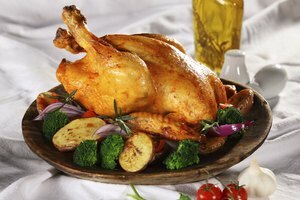 The instructions that came with your roaster suggest cooking a fresh bird for 15 to 17 minutes per pound at 350F, or a prebasted bird at 375F for 12 to 15 minutes per pound. Those times are based on the bird reaching a final internal temperature of 180F, which is the old-school standard for a cooked turkey. The USDA's current standards consider a turkey to be fully and safely cooked when it reaches an internal temperature of 165F, which leaves the bird a lot juicier and tastier. It's best to work from the shortest of those cooking times –12 minutes per pound for a prebasted bird, or 15 for a fresh one – and start checking your thermometer a good 20 to 30 minutes before you expect it to be done. 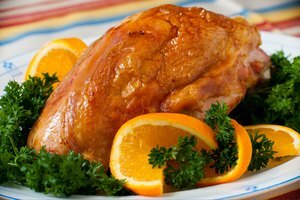 The turkey is ready when it shows a temperature of 165F or higher in both the breast and the inside of the thigh. If a golden-brown, crispy skin is your favorite part of the turkey, you'll need to take a few extra steps to make that happen. 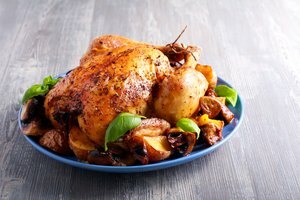 Rival suggests basting the bird with butter before roasting it and every 30 minutes during cooking. That works, but opening the lid so often lets out a lot of heat and can stretch your cooking time. Starting the bird at a temperature of 450F to 500F and then lowering it for the rest of the cooking time will give you a reasonably golden skin. It won't stay completely crisp to the end of your cooking time, though, because of the moisture in the roaster. 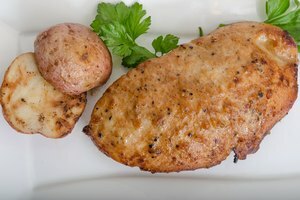 Transferring your bird to a conventional oven for the last 30 minutes of its cooking time is a better alternative if your oven isn't already filled with side dishes. For some cooks, crisp skin isn't as important as the perfect golden color. You can make that happen by basting the bird with butter or broth that has a few drops of gravy browning whisked into it. The browning colors your turkey's skin nicely for that Instagram-worthy hue.